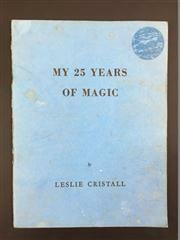 Leslie Cristall, 'My 25 Years of Magic'. Signed, First Limited and Numbered Edition. Published by the Author, 1966, no. 65. Bound in blue, minor wear on spine, circular mark, otherwise good condition, glossy pages with tricks and photographs within. Cristall, born in London 1910, was a member of the International Brotherhood of Magic and winner of the Magic Circle's 'Cecil Lyle Award'. Active for at least forty years from the age of fifteen, Cristall was renowned as a skilled and inventive magician.